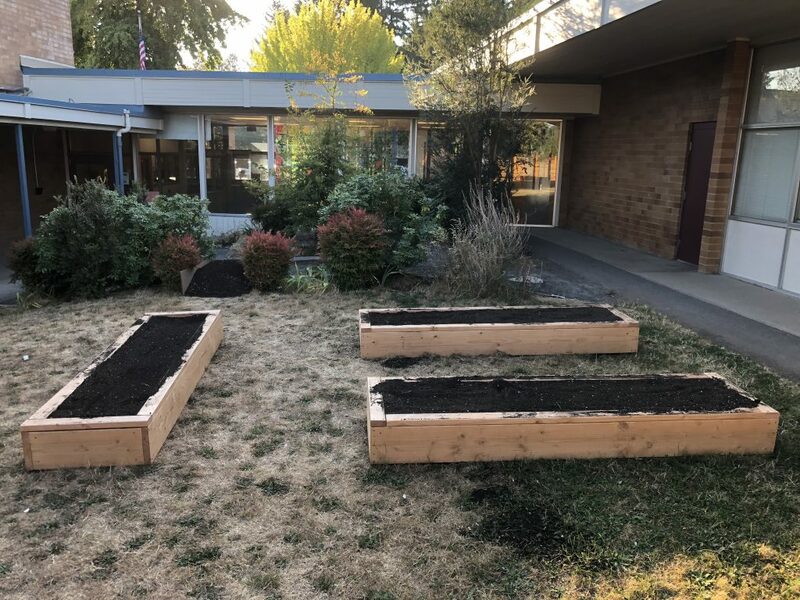 If you visit Chehalem today, you will see three beautifully designed and productive garden beds—the start of what may ultimately become a much larger project. 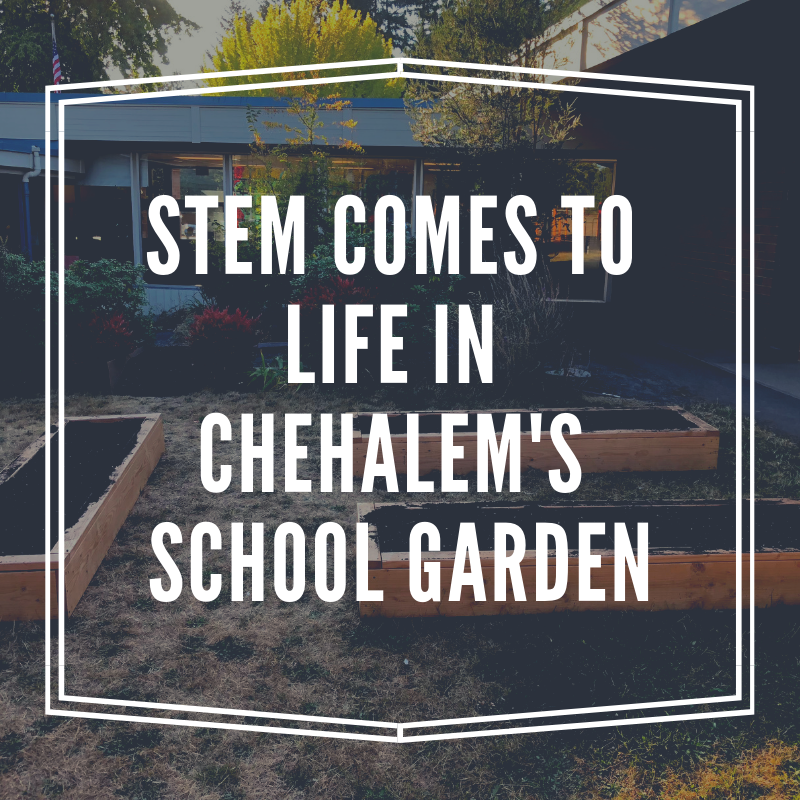 Chehalem’s three raised beds are located within site of multiple classrooms. Through the Lens of Science, Technology, engineering and Math, we strive to engage, inspire and empower a community of activated learners. The Activated learner is one who is curious and motivated, seeks understanding, and accepts responsibility for the outcomes of their learning. The learner demonstrates continued efforts and commitment, even in the face of adversity. Together we will work to make our school one where students want to learn, families are proud to take part in their child’s success, and staff members commit to support each individual students’ successes. Chehalem’s garden build team poses with their newly constructed raised beds. Student input was incorporated into the garden design primarily through last year’s science fair: Marc Wildfang challenged his 5th graders to propose garden plans that adhered to strict material and budget constraints. While no single garden plan provided the basis for the design ultimately settled upon, the garden team did utilize as many elements from students designs as possible. One example, still relegated to the realm of future expansion, is a garden library box that would house books relevant to the garden such as plant and wildlife identification guides. This year, 5th grade science projects will take on the challenge of engineering this small library. 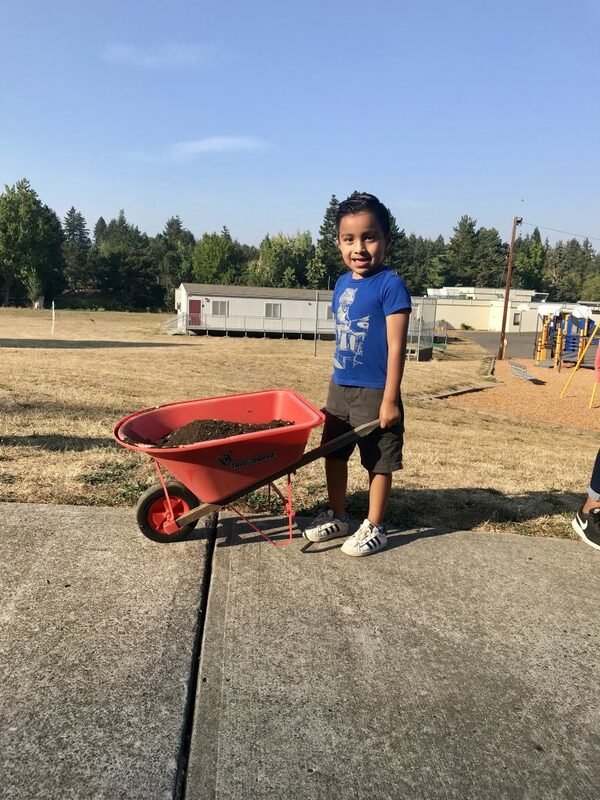 Chehalem students help build the garden beds, playing a major role in the establishment of the garden. Maintenence is overseen by the STEM team which coordinates with teachers and classrooms to assign garden tasks. The Parent Teacher Organization (PTO) is also a partner, and excited parents have agreed to care for the space during the summer break. This summer, maintenance coordination will be taken on by a member of the PTO. 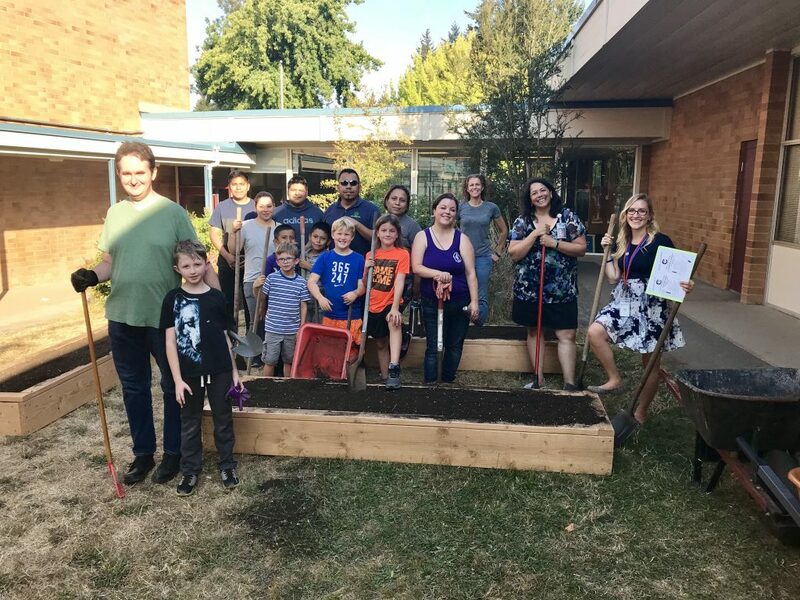 Students‘ families are welcomed participants in the garden, and played a vital role in constructing the garden beds during last year’s fall back to school night. In discussing family engagement in the garden, Wildfang shared that “We noticed an immediate impact of how a garden can support cross cultural learning.” The garden team excitedly observed that families that may sometimes struggle with school involvement due to language barriers participated in building the garden and are providing ongoing support. Though the program is still new, the rewards observed by the staff have been considerable. Building staff have come together to support one another as they strive towards the common goals of using the garden to strengthen community and address learning standards. 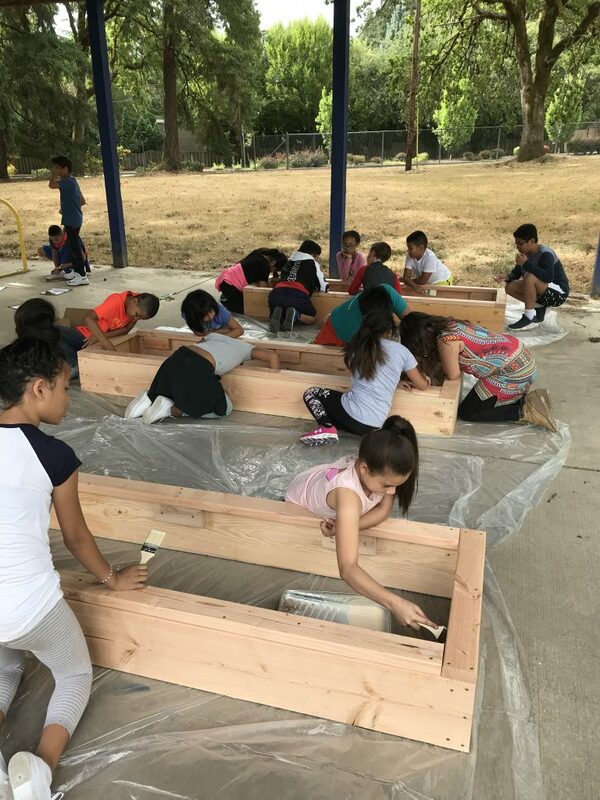 Knowledge is being shared among students and staff, and students are engaging with the garden with a “sense of inquiry and wonder.” Time, though, remains challenge as even the smallest changes to the program require intentional communication between multiple people. If you know of a school garden program that you would like to see featured here, get in touch! For resources on managing your own school garden program, check out our School Garden Resource Center.